If you could go anywhere on vacation, where would it be? If you are a fiber arts lover then come on over to Phat Fiber and join us on our dream vacations around the world! Sample boxes will go on sale on Saturday June 27th following a preview video on Thursday or Friday. I’ll share the video here on the blog as soon as it is released. If you would like a sneak peek as to where I dream of going on vacation, I present to you Colorado Echoes. 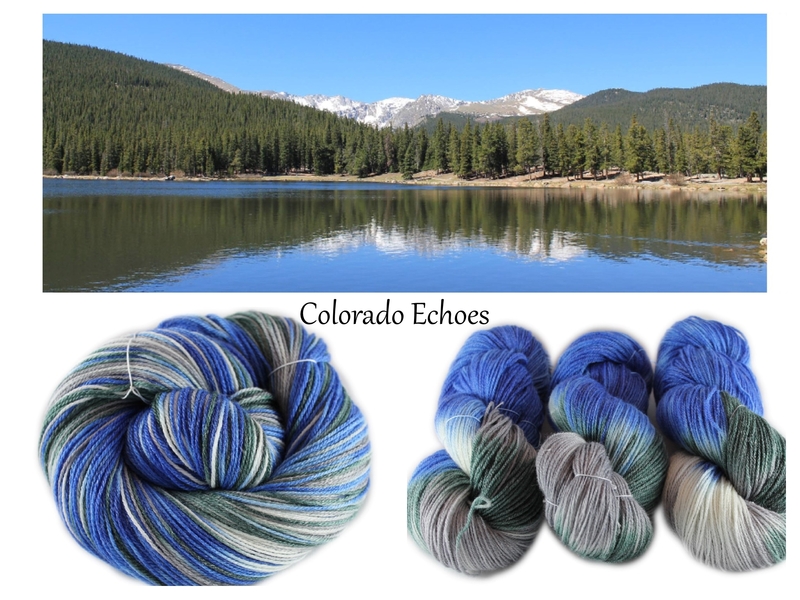 This newest colorway is inspired by the photo I took in June of 2013 of Echo Lake, Colorado while driving to the top of Mount Evans (14000+ feet elevation) with my fellow fiber artist, Barbara of Kitty Mine Crafts (go check out her Dream Vacation colorway – Versailles, which will be released soon). Don’t you just love the blue sky reflected in the water, the greens of the pines, and the crisp whiteness of the snow capped silver mountains? It’s so peaceful and serene. This is nature at its most beautiful and this colorway echoes what I love about Colorado. Currently, Colorado Echoes is dyed on Panda sock yarn (a blend of SW merino/Bamboo/Nylon), but it can be dyed on any fiber base or yarn weight/base I can obtain. Just contact me for information and I’ll see what I can do for you! Colorado Echoes will go on sale in my etsy shop on June 25th. Don’t forget to follow me on Facebook, Instagram, Twitter and right here on this blog for release announcement and shop updates!